RCA Svideo to HDMI converter adapter,Udigital 3RCA AV CVBS Composite SVideo RL Audio to HDMI Converter Adapter Upscaler Support 720P/1080P N64 Sega Genesis? If you are not 100% completely satisfied, simply contact us to request a refund or replace! We provide 1 year warranty ! This RCA Svideo to HDMI converters converts RCA (AV, composite, CVBS) or Svideo signals into HDMI signals so you can watch your video on a modern TV with HDMI ports. 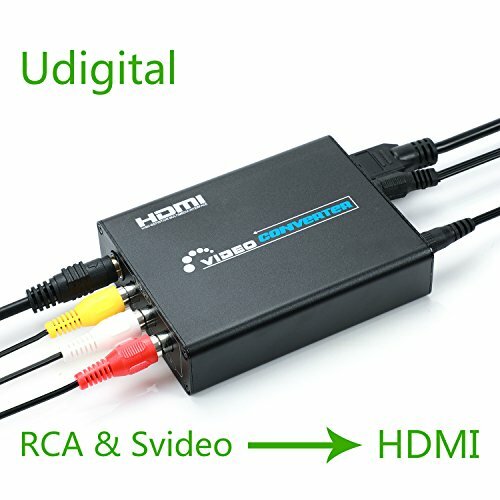 You can convert an RCA analog composite or S-Video signal to digital HDMI. It is thus possible composite or S-video for example, a camera, games console, VCR or DVD player to output to an HDMI TV, projector or monitor. 1. Up-scales Composite Video or S-Video up to full HD 1080p. 2. HDMI output is optional at 720P/60Hz or 1080P/60Hz. 3. Composite Video and S-video can stay simultaneous connection, and to be selected as the input them by the switch button. 4. Motion Compensated 3D Wavelet Video Coding Technology is applied to make the converted picture rich in color and more vivid. 5. Stereo audio is integrated into HDMI out as well as pass through 3.5mm audio output. 6. Input video signal - NTSC/PAL is automatically detected and adjusted. 7. DVI compatible by using HDMI to DVI adapter. 8. Settings of input signal & output resolution is auto-stored when power on again. # Picture quality depends on the quality of the input source. # We are direct manufacturers, quality assurance, never authorized other sellers sell Udigital converter. $This RCA Svideo to HDMI converter allows older analog devices to be integrated into today's HD home theater system.This RCA Composite video and S-video to HDMI Converter takes either Composite Video or S-Video as input and upscales it to HDMI 720P or 1080P. $ Input: RCA Composite S-video Video, R/L Audio. If you have any questions about this product by Udigital, contact us by completing and submitting the form below. If you are looking for a specif part number, please include it with your message.